It seems the whole of Reykjavik turned out to welcome the Iceland football team who performed so well in the Euro 2016 competition. England players slunk home wearing their expensive headphones and straight into their chauffeur-driven cars. Categories: Recreation, Relationships | Tags: England, Euro 2016, football, Iceland, Reykjavik, viking chant | Permalink. “Should we stay or should we go?” Well now we know. The NOs won it in the end after a lot of scare-mongering by banks and businesses about how an independent Scotland would suffer and a lot of promises for “Home Rule“. It’s clear that almost half of Scots want independence so they’ll be a lot of unhappy people north of the border today. And they’re are a lot of unhappy people in England too as we see just how far politicians will go in making promises to suit their own agendas. David Cameron won’t have a vote of no-confidence now; and Gordon Brown, the man who believes he saved the world after leading us into financial meltdown will now be claiming he saved the union. The West Lothian question. First raised almost 40 years ago and still unanswered Why should Scottish MPs be allowed to vote on English law and taxation when English MPs can’t vote on Scottish, or Welsh, or Northern Irish issues like NHS care, student fees etc? Because the other countries have devolved powers is the unsatisfactory answer to that. The Barnet formula. Devised in 1978 to stop discussion on devolution it divides public spending between the UK nations. Average spending per person in England is £8,788; Scotland receives 16% more at £10,100 per person; Wales gets £9,800 per person; Northern Ireland gets£10,900 per person. So England, despite having 85% of the population gets a bum deal but all three parties have pledged to keep it for ever if it’s a NO vote. The McKay Commission was set up in 2012 to look at procedural changes in relation to laws only affecting a part of the UK and it recommended that new laws affecting only England should require the support of a majority of English MPs. The government has ignored the report so far even though in the Conservative party manifesto it promised “English votes on English Law”. David Cameron has said the commission had produced a “good report“. Was it any different this week? Categories: Relationships, Work | Tags: Barnett formula, David Cameron, England, Gordon Brown, independent Scotland, Nick Clegg, Northern Ireland, politicians, promises, Robert Burns, Scotland, scottish referendum, Wales, West Lothian question | Permalink. 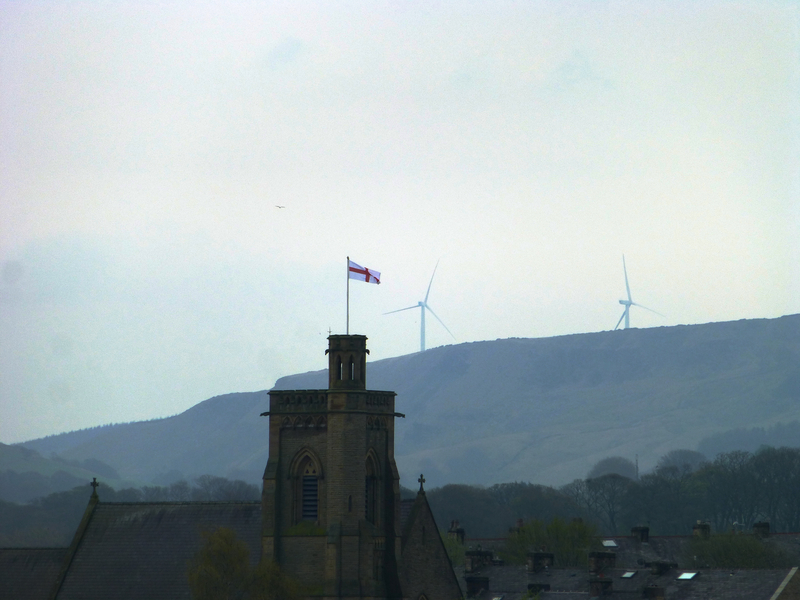 Flying the flag as the wind turbines on the moors behind stand silent as if saluting it. The photograph was taken from the banks of the Leeds to Liverpool canal in Burnley, Lancashire. Categories: Education | Tags: Christian, England, Lancashire, military saint, patron saint, religion, Roman soldier, St George's Day | Permalink. Santander recently announced that the call centres set up in Mumbai (formerly Bombay) by building societies, which are now part of Santander, were all closed down on July 1 and since then all their call centres have been in the UK, in Glasgow, Leicester, and Liverpool. This is in response to Santander consistently being rated the worst bank for customer service. It is now ranked second worst after Barclays (which still has one call centre in India). Indian call centres are a source of frustration to UK callers. Sometimes you can’t understand the accent and their adoption of English names, presumably to make you believe you are speaking to someone in England, is farcical. Also as problems have become more complex scripted responses don’t work so well. The reasons for returning to the UK may not be totally altruistic as labour turnover has increased amongst the graduates who work in Indian call centres and wage costs have risen. Competition from the Philippines has also reduced India’s market share which has grown significantly in recent years. Santander weren’t the first to make this decision. 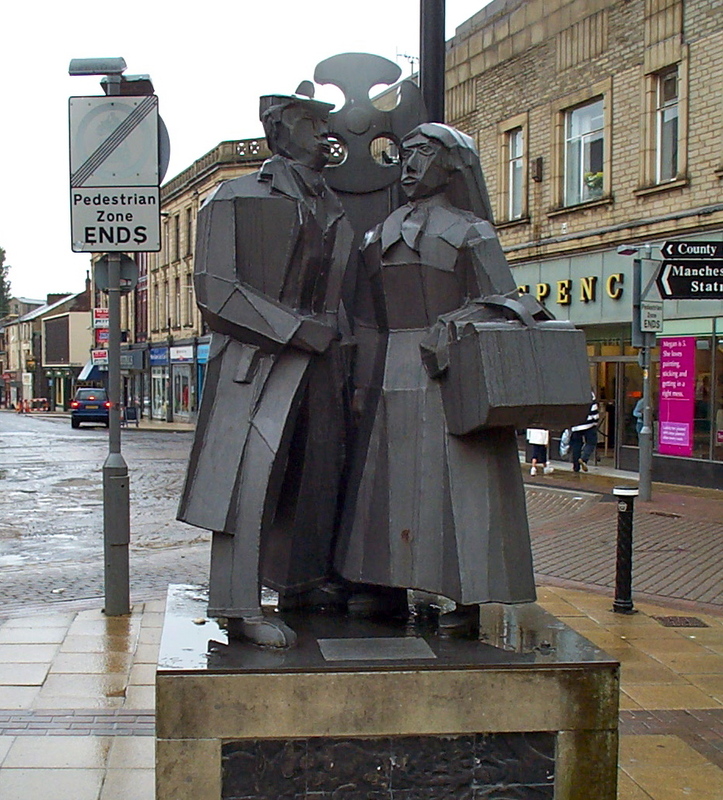 A lancashire telecom company, New Call Telecom, earlier announced that they were setting up a call centre in Burnley rather than in Mumbai. They said that staff in lancashire were hard-working and loyal and customers preferred dealing with people in this country. Some banks such as the RBS, including NatWest, have always had UK call centres. NatWest however seems determined to force people to use automatic paying-in machines. The branch in Burnley closed down two cashier positions over a weekend earlier this year and rebuilt the wall so you couldn’t tell they were ever there. This means the queues are getting even longer yet they have staff walking around asking if you want to pay in automatically despite customer complaints that they want to deal with a person. And how annoying is it when, after you have actually got a cashier to deal with your task, they ask if there is anything else they can do for you? I’ve suggested they might wash my car or carry my shopping but to no avail. Now if I said I wanted to buy an insurance policy or see a financial advisor I bet I’d get a cup of coffee! And I found out today that Santander only does business banking with automatic paying-in. So give them credit for the call centres but not for their automation – which means fewer jobs in the long run. Categories: Work | Tags: automation, Barclay's, Burnley, call centres, customer service, earnings, England, India, Mumbai, NatWest, RSB, Santander, self-service machines | Permalink.